This weekend was the official start of Autumn! I, of course, tried to fit in as many Fall activities as possible! It was also the first weekend that it truly felt like Fall weather; I actually got to wear a sweater & my Frye boots! If you follow me on Instagram you got a sneak peak into our weekend. We started things off on Friday morning, with Conor staying home for the early part of the morning to have breakfast with Liam & I! This is such a treat, because usually he has left for work before we even wake up for the day. He works incredibly hard to support our family, and I am thankful for all that he does every day. Well it turns out, Friday morning he was recognized for all of his hard work with an unexpected raise (well, maybe a little bit expected)! I was so proud of him, so I decided to buy a bottle of one of our favorite champagnes to celebrate with later that night! 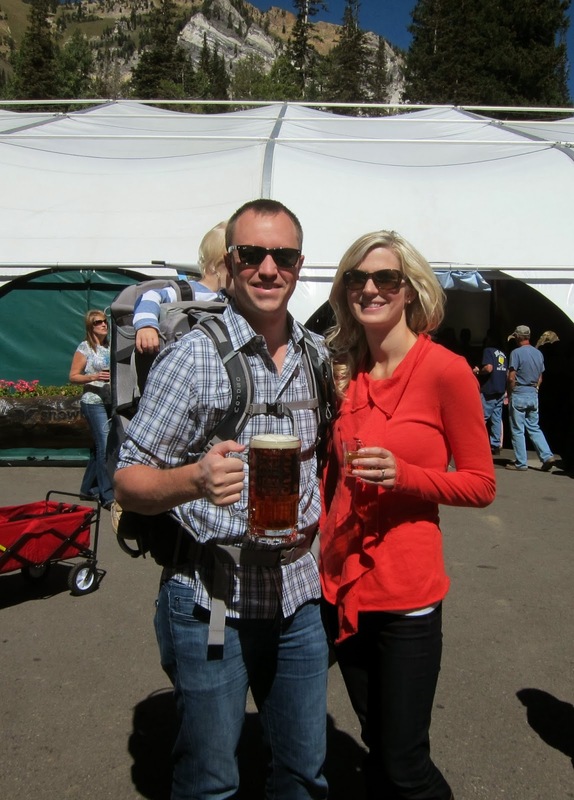 Saturday was filled with college football and trip up to Snowbird for Oktoberfest! The best one we've been to was in Arlington, VA years ago. but Snowbird's was definitely working it's way up the list! The only bummer was the lack of hard cider, so instead I sipped on a glass of wine. Yeah, I was that girl drinking wine at a beer festival! 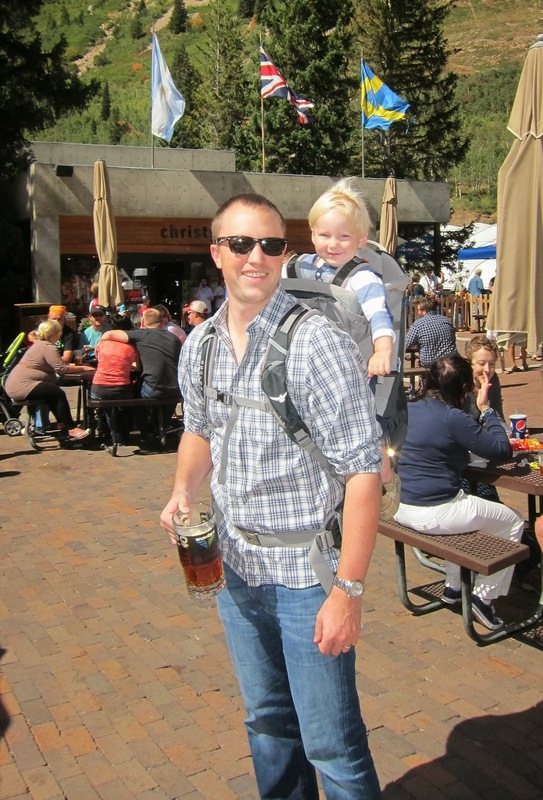 One great thing about Utah is that almost everything is kid friendly. There were kids everywhere; they even had inflatable bouncy things (descriptive huh?) and the summer mountain rides and slides run by the resort. Liam was content just chilling in our Osprey pack checking out all the people while we enjoyed the sunshine, drinks, & friends. There's a good chance we will be back again next weekend.... and I may or may not bring my own supply of hard cider. The burlap on our banisters is a new addition this year, and I just can't get enough of it. I put some on our mantle as well, and I'm sure I will find another area of the house that could use some burlap. I'm even thinking that I may use it in my Christmas garlands this year. I spotted the wheat at my local grocery store, and I knew it would look perfect in a clear vase. I think it looks subtle yet festive! The pumpkin candle holder is from Milburn Orchards in Maryland and is still one of my favorite things! It is the perfect centerpiece come Thanksgiving. It's hard to see in this small picture, but I also have similar tiny pumpkin place card holders around the big one (also perfect for Thanksgiving)! I believe those were found at Pier1 a few years ago. The hurricane jar is from Pottery Barn & the Fall potpourri I found at Michael's a couple of years ago as well. The wicker pumpkin is from Joann Fabric and was actually purchased just this year. I also spent a majority of Sunday in the kitchen cooking up a storm! First off was applesauce, which I through together in the crock pot and let cook all day. I looked up a few different recipes from Pinterest and then came up with my own. While the smell of cinnamon & apples was filling my house, I cut up some pie pumpkins and roasted them in the oven to make my own pumpkin puree. I never buy the canned stuff anymore, because making it from scratch is a million times better! I had enough pureed pumpkin to make a batch of curried pumpkin soup and pumpkin chocolate chip cookies! I also roasted the seeds, of course, so we enjoyed pumpkin everything all day! I'm thinking about sharing all these recipes, since my zucchini bread recipe was such a hit (it just went crazy on Pinterest!). If I have the time this week I may do a few recipe posts, or add a recipe tab to the blog, we shall see. and have had just an amazing start to Fall like the Keenan family has! Yes share your recipes! They sound great! What a fun weekend!